As I have mentioned in some of my recent posts, I'm a sucker for Butter London nail polish.. (well, ok, who am I kidding - any nail polish, but, in particular, I have been loving me some BL lately!) - BUT - I have acquired a few A England's in the last month.. And I am smitten! First, I will show you Guinevere, which is a part of The Mythicals collection.. I will admit, this wasn't a polish I would have actually chosen on my own.. I'd be like 'oh, a nice light purple/lilac shade.. next! ', BUT, I saw this used on The Nailasaurus' blog a little while back and passed out. It was so stunning! That is a serious problem for me and my obsession with nail polish. One swatch, and it is game over. It is listed at the a england website as being "beautiful, elegant, antique, pale mauve, the newest neutral shade; already a classic" Uh, yeah. This was two coats with some seche vite top coat. Next up, Ascalon... which is a part of The Legend collection.. This was a last minute impulse/toss in to my cart before I check out type of purchase.. Glad I did! The site says: "Forged by magic and guided by our hero's sainted hand, the steely grey of his spire is alive with a swirling heart of lavender fire." 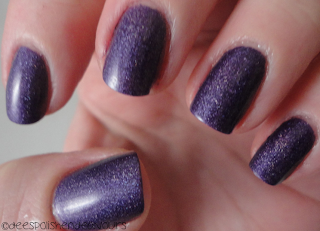 I know you probably cannot see the hints of lavender in this gem - but trust me, it is there! I think this one will be amazing for stamping! This was two coats and no top coat. Ohhh Lady Of The Lake.. which is a part of The Mythicals collection.. I have seen so many photos of this gem that it was a no brainer. I envision some type of gradient with Ascalon and Guinevere in its near future. The site says: "dusky purple with rainbow glimmer and glow". Agreed. Gorgeous! This was two coats, no top coat! I ordered Guinevere, Ascalon, and Lady Of The Lake via the early access sale at Nail Polish Canada - they actually almost sold out within the first 24 hours just from the early access sale - which I'd say is pretty rad! Now we have Dragon.. which is a part of The Legend collection.. I look at this photo and I can honestly hear a hallelujah choir.. It was a lemming of mine.. And to now have it with me? Amazing. I am seriously in love with this bad boy here. The site says: "Like sunlight glinting off his iridescent mossy green scales, the fearsome Dragon lays basking arrogantly, awaiting his due." I kind of love their descriptions - just saying! Hey.. Does anyone know what this would look awesome in... (: - again, two coats, zero top coat. Last, but certainly not least, we have Saint George.. which is also a part of The Legend collection.. So. Freaking. Pretty! The site says: "Bearer of a valiant & courageous heart, this fathomless teal reveals the strength of the brave knight's convictions with his gleaming, fiery core." This was two coats with no top coat. 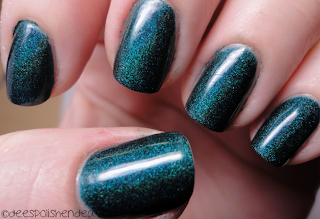 I bought Dragon and Saint George from Ninja Polish a little while back.. And haven't shown you all til now.. So rude of me to keep these lovelies to myself! I can honestly say I am completely overjoyed with every single one of these a england (I never know if I should capitalize the letters or not - I see it done both ways.. ???) polish. Again, if you're like I was, just sitting back, looking/drooling over photos of these gems - do yourself a favor and order one or two - then you'll quickly be ordering three, four, and more. I am looking forward to getting some more myself! Also, these polish have some serious shine to them! I didn't even have to use top coat for shine purposes.. BUT.. I mean, to protect them, I would, of course! I hope you're all having a wonderful day! I will see you all soon with some other goodies soon!! Take care til then! Holy SHYTE that last one is amazing!